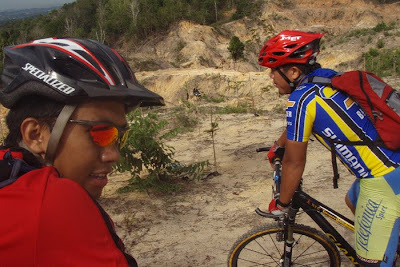 Today is the 6th times and the training for today was at Hutan Simpan Berakas. 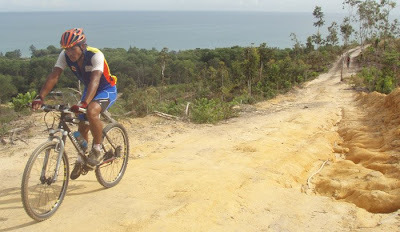 The last 3 training was endurance training on the road using MTB. We were told to come at 8am in the morning, but we decided to come a bit early at 7am. Pintu pagar hutan pun alum buka. By the time the gate was open, there was already 5 cars queing at the gate. The 3 of us managed to do 2 laps before the other riders arrived. For today training the 3 of us managed to do 4 laps altogether. The fastest lap was 17 mins by GD and the slowest was 21mins. Aliuddin still managed to smile infront of the camera. 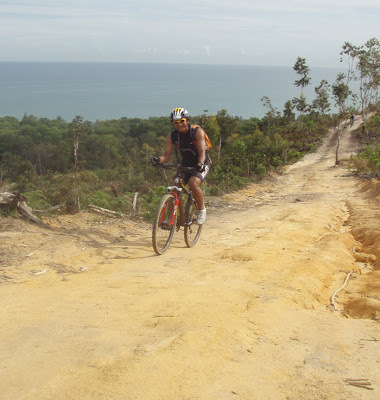 From what we were told, there are still empty slots for long distance road race 150K (5 laps). Most probably, kami akan ikut serta just for the sake of meramai ramaikan. 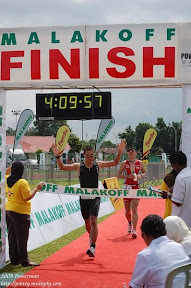 For sure inda pulang abis 5 laps, gerenti kena potong. Kami ikut pun because we are pretty sure that we will not be the slowest or unfit riders, there will be other riders yang bulih kami makan - KALI JUA TU!!! karang kami yang kana makan.